Link Up shares the educational expertise and resources of Carnegie Hall (NY) with arts organizations and school districts throughout the United States. Carnegie Hall (WV) and The Weill Music Institute of Carnegie Hall collaborate to bring this exciting program to West Virginia schoolchildren. Using the Link Up curriculum, 4th grade students engage in interdisciplinary classroom instruction to increase performing, creating and listening skills through a series of sequentially “linked” activities, which include a culminating concert in the spring. 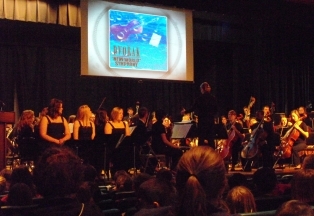 Throughout the concert, the musical concepts that the students have studied during the year are demonstrated, and students are given the opportunity to play a recorder and sing along with an orchestra. All music teachers participate in professional development workshop, offered in the fall. Curriculum support materials are provided for students and teachers by Weill Music Institute. Carnegie Hall in Lewisburg provides the soprano recorders and coordinates the program through Greenbrier County Schools.